From about 1947 to 1969, the names of Vandercook employees who inspected presses at the factory were stamped into the body of the press, suggesting a pride in craftsmanship. 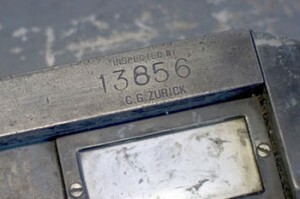 However, certain models and some individual presses manufactured during this period do not bear an inspector’s name. C.M. 1962 20971–21949 SP20 2 Possibly Conrad Majewski, or Charlie McLaughlin, see Vandercook Employee Roster. Harold Neff 1951–67 14898–27078 219 AB, Uni I, SP15 38 Name also appears as "H. Neff," "Neff," and "H.N." J. Waldier 1967–73 27044 Uni I 1 Stamp is upside down. Waldier was Service Manager, so this may have been a joke. 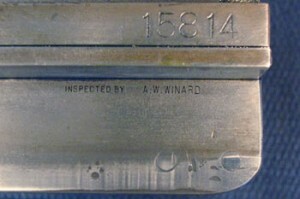 To see if a press has an inspector’s name, locate the large serial number stamped into the bed bearer (the smooth rail) at the right end of the press on the operator’s side. 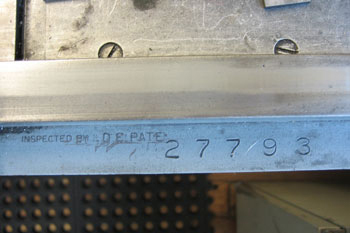 Look below this number to the outer surface that supports the carriage (e.g. No. 4, Universal and SP series). 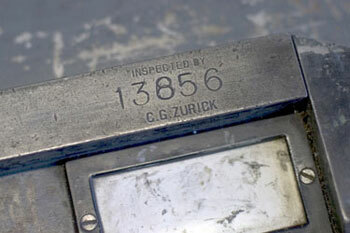 On older presses such as the 219, the serial number and inspector name both appear on the bed bearer. Because company records relating to employee job functions no longer exist, the above data, compiled from multiple sources is incomplete. To contribute to it, please visit the employee roster page.